IVT is a VT220 terminal emulator for Windows NT/2000/2003/XP/Vista/Win 7/8/10, that can set up a secure SS, (Kerberized) telnet, connection to a remote host. It supports multiple (tabbed) sessions of different types in a single window. If you use a PC to access remote hosts and you care about fast, accurate VT220 terminal emulation with a large tabbed screen, multi-session, color support, fast copy/paste etc. because you use Unix text-mode applications such as EMACS, VI or Midnight Commander, then IVT is a program designed for you. 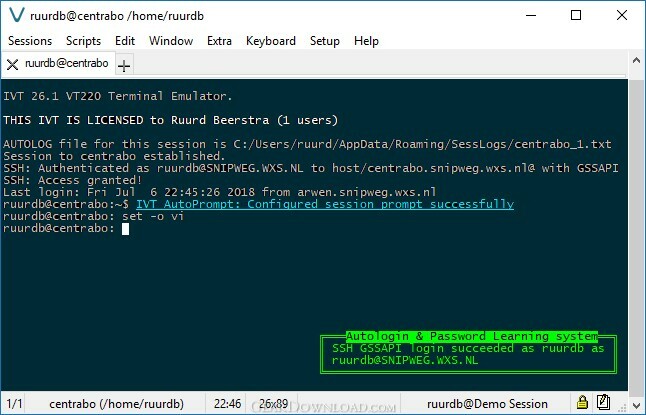 If you want secure authenticated login, you can use SSH or the Kerberos V5 authentication and encryption support. Logging in to an array of hosts with either Telnet, Kerberized Telnet, SSH or modem, starting programs there, automatically analyzing the output, customising the keyboard and screen (different key-mappings and colors per host and/or session if you want to) is all easily achieved. Designed to work in environments with hundreds of Unix machines, IVT is tailored to make life in such environments easier. What's New: Bugfixes. Putty import, new cryptography support, XTERM 256 color support, color themes, many smaller improvements. This download (ivt_sa_26_2.64.zip) was tested thoroughly and was found 100% clean. Click "Report Spyware" link on the top if you found this software contains any form of malware, including but not limited to: spyware, viruses, trojans and backdoors. IVT Secure Access 64bit 25.2.38358 - SSH/Telnet client with auto-login, multi-session, scripting, file-transfer, etc. LanHelper 1.99 - Monitor, analyze, and manage a network. Techinline Remote Desktop 2.5.1.0 - The easiest remote desktop access service that runs on a web browser. WebAdmin 3.3.2 - Securely manage MDaemon, RelayFax, and WorldClient from anywhere in the world. RDM+ 3.3.7 - Easy-to-use, reliable and secure remote access software for mobile phones.